When Phillip arrived at North Shore Animal League America in January, nobody thought the adorable mutt-i-gree® would have any trouble finding a loving home. Unfortunately, seven months have passed and he still hasn't found that perfect match. It was discovered early on by Animal League America veterinarians that the 1 and a half-year old dog had retinal degeneration, which is causing him to progressively lose vision in both eyes. 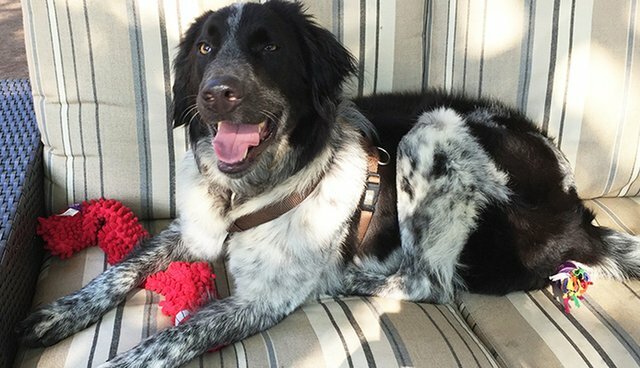 Obviously this handicap has hindered the spaniel/setter mix's chances of being adopted because he does require a bit more patience and understanding than a healthy dog. He still has an abundance of love to give and will make some adopter's life complete when he finally gets that opportunity. Animal League America Foster Care Manager Tara Guclu has gotten to know Phillip quite well over the past few months and said you'd never tell by his larger than life personality and jovial demeanor that Phillip was a special needs animal. "He's a very happy, outgoing dog, and would do best in a home with another confident dog," Tara said. "He does still have some vision, but it's unclear how much or how quickly that will change. What I am certain of is that he will always be the same loving dog regardless if he can see or not." About a month ago, it was decided it would be best for Phillip to be taken off the adoption floor and placed in our Foster Care Program. The logic behind the decision was that he would make an easier transition into a permanent home if he had the opportunity to learn how to adjust to his disability in the same environment rather than living in the shelter. He was placed in the care of one of Animal League America's most trusted Foster Parents - Allison Monaco - a decision that we hoped would help transform the pooch into the perfect adoptable pet. "Within 10 days Phillip adjusted to his new surroundings," Allison said. "It didn't take long for him to be able to navigate around the house and even make his way down a few stairs to go outside without any trouble. He loves walks, gets along and plays with my other dogs, and is very gentle with my children. He's house-trained and knows his basic commands, and we're also working on other commands like 'lay down' and 'paw.'" Allison is so committed to her duties as a Foster Parent that she is actually beginning a renovation to her home that will include a separate room with four to five comfortable kennels, a separate fenced-in outside area and even a doggy bathtub! These are the types of volunteers that make Animal League America the ultimate sanctuary for all homeless companion animals in need of a second chance. If you're interested in adopting Phillip and providing him with the love and support he's been in search of, please contact Foster Care Manager Tara Guclu at 516-883-7900 Ext. 352 or tarag@animalleague.org.